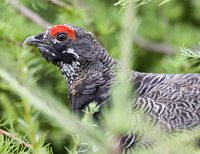 The Upland Game Program is responsible for the management of various species upland game, (i.e. ruffed grouse, ringnecked pheasants and Hungarian partridge). Activities include, as required, various population and habitat surveys, biological studies, biological collections from harvested species, analysis of harvest trends and liaison with user/interest groups. The synthesis of this information provides the framework for scientifically based decisions on regulatory management of harvested species, input for species and habitat management into the Integrated Resource Management process of NS Department of Lands and Forestry, and development of policies related to the management upland game species.